Last month I had the opportunity to speak at a Microsoft event about best patterns and practices of Microsoft Azure development. 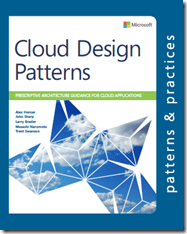 Today I noticed that most of the things we talked about at the event is included in a very nice book available for free from Microsoft Press: “Patterns & Practices: Cloud Design Patterns”. So if you’re interested on how to build your software for Microsoft Azure this is a very nice starting point. Containing twenty-four design patterns and ten related guidance topics, this guide articulates the benefit of applying patterns by showing how each piece can fit into the big picture of cloud application architectures. It also discusses the benefits and considerations for each pattern. Most of the patterns have code samples or snippets that show how to implement the patterns using the features of Windows Azure. However the majority of topics described in this guide are equally relevant to all kinds of distributed systems, whether hosted on Windows Azure or on other cloud platforms. The example applications for use in conjunction with Cloud Design Pattern guide. It consists of 10 samples to show how to implement design patterns using the features of Windows Azure. See the Readme for information about the sample code. Each sample has a corresponding readme for information about how to run the sample. Note: The samples are simplified to focus on and demonstrate the essential features of each pattern. They are not designed to be used in production scenarios.